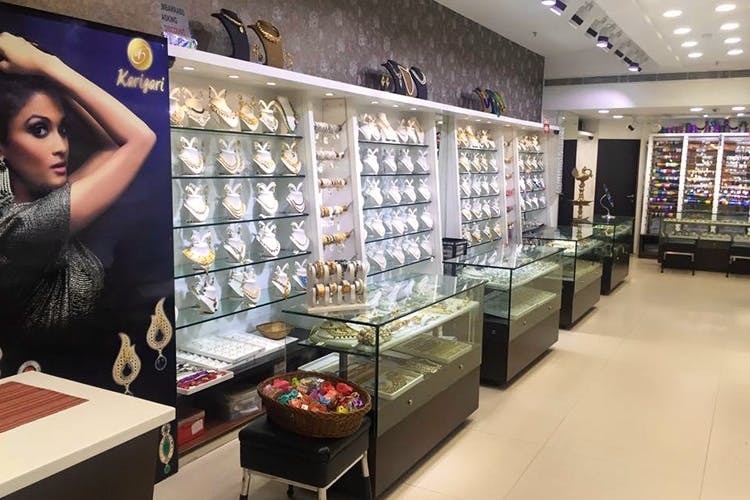 Karigari, a jewellery store located on MG Road has the solution to all your wedding season woes, whether you need traditional designs or basic pieces to wear on a daily basis. They also offer free ear piercings, so if you’re feeling impulsive, this is a hygienic environment to act on it. They take things to another level with their matha pattis, passas, haath phools and much more. They also have a range of stunning temple jewellery. We love their collection of earrings, statement necklaces, nose pins and jewelled watches. Their earrings are priced very reasonably, starting at INR 299. If you’re looking for some classic pieces to wear to work, you should definitely check out their collection. They also have many outlets (including Noida, Karol Bagh, GK 1) and are available online too. While they hold ample variety, this store isn't really the one to hit up if you need something on the more modern/contemporary side.